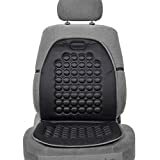 DLUX Bubble Seat Cushion provides massaging effects as well as improves posture and comfort. With air circulation, magnetic properties, and padded bubble material. Great for long drives- reduces aches and pains.